This is a very deep spiritual ride into new territory for humanity. 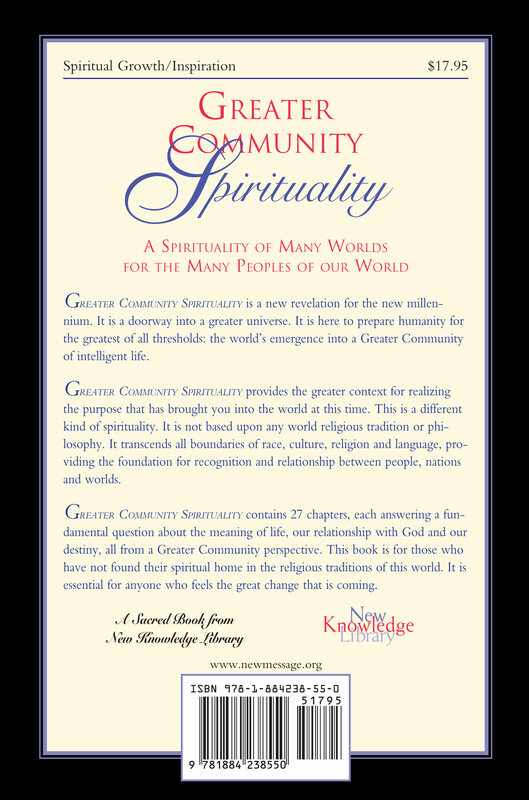 The book "Greater Community Spirituality" contains 27 chapters, each of which answers important questions about the meaning of life, our relationship to God and our fate - from the perspective of the Greater Community Perspective (=intelligent life in the universe, the greater community). It is aimed at people who have not found their spiritual home in secular religions. What is the fate of mankind? It is a new revelation for the millennium. It is a gateway to a larger universe. It is here to prepare mankind for the greatest challenge: the coming of mankind into a Greater Community of Intelligent Life. Greater Community Spirituality enables the wider context of the purpose to realize what has brought you into this world at this time. This is another kind of spirituality. It is not based on a secular religion or philosophy. It goes far beyond all borders of race, culture, religion and language and creates the basis for a recognition and relationship between people, nations and worlds. For me it is one of the most important spiritual books of our time. I further recommend from the Messenger, Marshall Vian Summers, "Steps to Knowledge" a spiritual practice handbook for everyday as a self-learn course, ancient and practiced throughout the universe by the wisest civilizations. I can also recommend from the same author the 3 briefings of "The Allies of Humanity", "Life in the Universe", "The Greater Community" etc. Marshall Vian Summers will be remembered as one of the most regarded spiritual teachers of all times. Find out for yourself.